Yesterday, September corn closed down 2 1/2 lower to $3.33 1/2, and December corn closed down 2 1/4 to settle at $3.48 3/4. Low volume and no supportive news caused corn to take the path of least resistance, down. The Delta is starting harvest and reporting good yields but expected to slow down with Tropical Storm Harvey moving in. 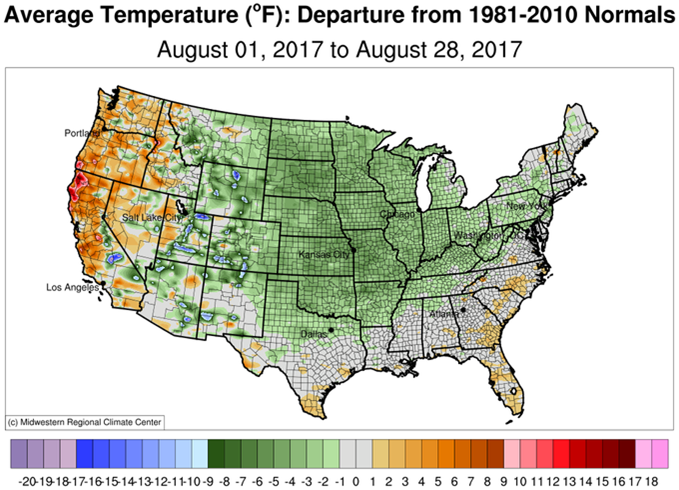 With the crop behind and spotty frost in the Northern States, trade is starting to question the cool weather and if corn will be able to fully mature this year. The September beans fell lower 4 1/2 to close at $9.30 3/4, and the November contract fell 4 to close at $9.37 1/4. New sale of 198,000 MT to China was announced yesterday, but with a large bean crop, it’s not enough to stir any upward movement.